You are here: Home>Topics>Schools and Education>Schools>My Memories: Peartree Primary School. My Memories: Peartree Primary School. "Moatwood, the oldest school in this town"
After I finished Ludwick Infant School under the evil Miss Scurfield in July 1949, I then continued my primary education at the nearby Peartree Primary School. As I remember it, the school had railings over the front and then a wooden gate over the front that looked into the car park and the main entrance. Our headmistress was Miss Gladys Collings, who we all had mixed opinions about. My memories of her are certainly happy. The school had outside toilets which was in little hut cabins which were at the left hand corner of the site, and were literally frozen to death in winter. How the pipes did not freeze is beyond me, but they never did. There were two boys and two girls toilets – Miss Collings made strict rules that the toilets were to be locked during lesson time. Break her rules and she wouldn’t be happy! Well we had a prompt start of 8:55 AM; Miss Collings would be very strict on punctuality. Every teacher had to keep a list of every student that arrived late to class, and Miss Collings would send her secretary round to collect the lists. They then would be kept back at the end of the day to do a 15 minute detention – your parents weren’t informed back then! Because we knew how severe she was with lateness, we were all on time. We had 5 minutes to do the register then we began our daily activities! We had a 20 minute break, and we used to play in the fields at the back of the school. There were very dodgy fencing at the back with holes in everywhere, so people escaped using the back fence. Of course, there were teachers looking after us. Our lunch was 1 ½ hours, but back then you could either go home for lunch or eat at school with a packed lunch or school dinners. I had school dinners and I ate really quickly then Mum would drive to Peartree to pick me up then we went in to see Dad. She drove me back when she had to go back to work. Our school day finished at 4PM, which the students loved!! Miss Collings insisted that a parent/guardian was to collect their child from their class when school was finished. My mum worked 9 to 5, and my dad worked 8:30 to 6. Miss would look after us on the back field and play various games with us, until our parents arrived. My mum would come and pick me up at 4:15 PM then take me home, and then race back to work until 5. She was very good to us, and ensured the best environment for her pupils. Many of the teachers were like her; she did a strict teaching assessment on them before hiring. A lot of staff went and left quick because of the fact Moatwood wasn’t very modern and exciting. Well I began getting really nervous in my last year (1952-1953) because I had to take the 11-plus “Scholarship” exam but my dad said I had to revise if I wanted to get into grammar school – I really wanted to go to grammar school so I could look smart to the others. One day I went in early and went to Miss Collings’ office, and said to her, “Miss, I’m nervous about the Scholarship and I don’t want to do it” and she gave some really good advice!! When I got my results over August, I was absolutely thrilled to death I was going to grammar school. The hard work paid off, especially Miss Collings’s advice. This page was added on 06/10/2015. Like George, I went to Ludwick (Twice in 1958) and Peartree school, but later 1959 -63. My father died in an accident when I was five, so during that one year I changed school four times from a school in London to Ludwick to Rollswood and back to Ludwick. In August 1958 my mother, my sister and I had a council house in Peartree Lane and my life settled down. It was about this time that the school changed it´s name from Peartree to Moatwood, but we still called it Peartree. My first day at Peartree I went to the girls toilets, by accident. The toilets were not marked boys or girls, you had to know. We had a headmistress at first and there was a picture of a child and a dove by Picasso in the hall. For many years I thought that, the picture was the original. After about a year the headmistress retired and we had a headmaster Mr Scarnell. He was not popular in the school with the children for several reasons. The school cook was Mrs Chivers, who lived not far from us. We learnt the multiplication tables by rote, which was very very boring. My family lived four houses away from the school, so some days I left home when I heard the school bell. Later I was a “Water monitor” which meant that every morning I had to carry two buckets of water out the two concrete annexes. 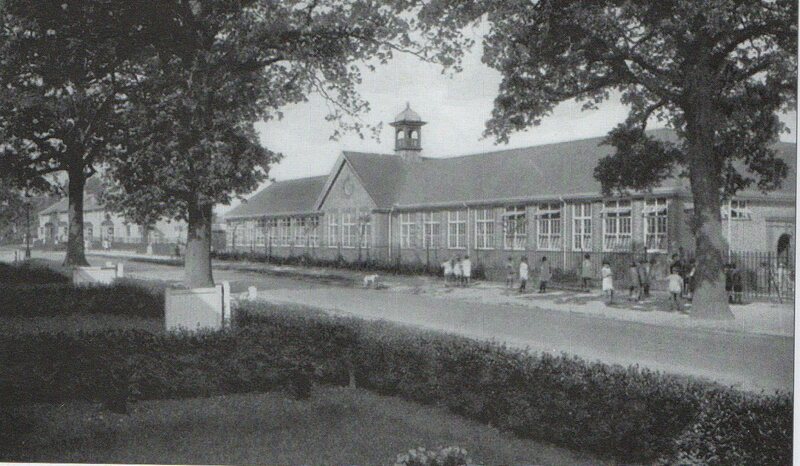 They were built during the war for to increase the school capacity for evacuee children. These buildings had no water supply, but were still in use in the early 60´s. In the summer a “J” shaped running track was marked out in the school field for the school sports. The boys wore shorts and long socks summer and winter. I had my first long trousers for my 11th birthday. I also took the 11+. Everyone in one class passed, and everyone in my class failed. I remember that for some questions I had not the faintest idea what I was supposed to do. The only consolation was a day off school. We also had some time off school for the opening of the QE2 hospital, where we had to line the route the Queen took to the hospital. Many of us didn´t return to school that day. In my last year I was in Mrs Crofts class. The Garden City's junior "bandsmen"